Abu Dhabi: Oil-producing countries agreed to cut production by 1.2 million barrels per day from January 2019 for six months to rebalance oil markets and support oil prices. Brent crude, the international standard, up $3.11 a barrel, or 5.2 percent, at $63.17 on the news. Benchmark New York crude was $2.23, or 4.3 percent, higher at $53.72 a barrel. At a crucial meeting on Friday in Vienna, Opec and non-Opec members like Russia resisted pressure from US president Donald Trump to reduce production to prop up oil prices. Trump insisted on lower oil prices and more output from Opec. Opec will reduce output by 800,000 barrels per day and non-Opec by 400,000 barrels per day, UAE Minister of Energy and Opec President Suhail Al Mazroui said during a press conference, which was streamed live on Opec website. Exemptions were given to Iran, Venezuela and Libya as their production is hit by sanctions, economic turmoil and conflict respectively. The deal is fox six months with review in April 2019. 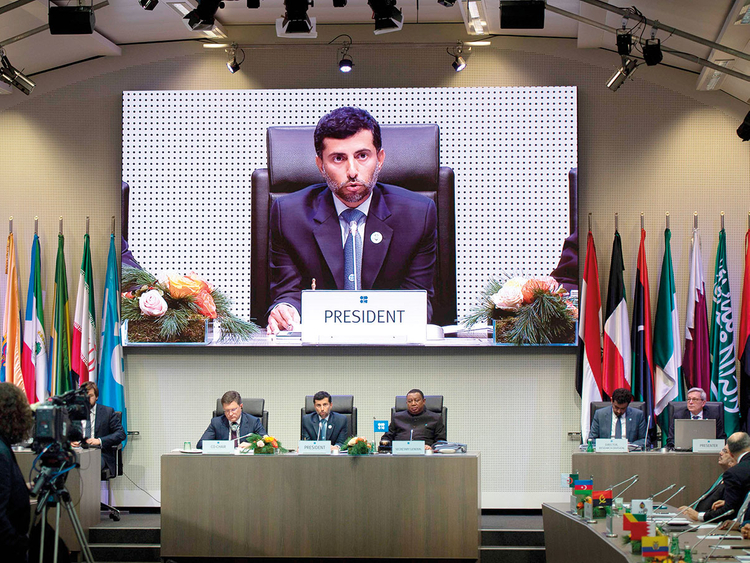 “We among Opec are committed on 800,000 and deliver on it,” said Al Mazroui. “Saudi Arabia is committed to market stability. Our guiding principle is balancing demand and supply. We are not in the business of cutting but also in releasing supplies when required,” said Saudi Energy Minister Khalid Al Flalih. The move came as oil prices were trending lower in the last few weeks due to over production from Saudi Arabia, Russia and other countries and concerns on global economic growth. From more than $85 per barrel in October, oil prices plunged to less than $60 per barrel in recent times. Saudi Arabia, Russia increased production anticipating shortage in the market following US sanctions on Iran. Analysts reacted positively to the decision and said the agreement to cut production by 1.2 million barrels per day (mbd) is a major accomplishment, particularly by the Saudi authorities, the UAE and Russia. “Such an agreement would stabilise the oil market. Brent crude oil prices could rise again to the range of $65 to 70 per barrel, as we expected at the International Institute of Finance,” Garbis Iradian, Chief Economist for Mena at Institute of International Finance in Washington told Gulf News by email. Ehsan Khoman, Head of Mena Research and Strategy at MUFG Bank Ltd said Opec and its allies have delivered a higher than market consensus, and the agreement is likely to lead to Brent surpassing $70 per barrel by January 2019. “Critically, the lack of a published quota list by country is a significant departure from the existing production agreement, signalling the heterogeneity between Opec plus members mindsets,” he said adding higher oil prices will help shale producers in the US to increase production. Earlier in the day, there was a stalemate in the talks as Iran insisted on exemption from output cuts due to US-led sanctions. Iran is the third-biggest oil producer within Organisation of the Petroleum Exporting Countries (Opec) group and is facing US sanctions due to its controversial nuclear enrichment programme that hit its oil exports and economic growth. Iranian Minister of Petroleum Bijan Zangeneh told reporters in Vienna that as long as Iran is faced with sanctions, it will not participate in any agreements on production, the country’s website Shana reported. US reimposed sanctions on Iran in November and asked a number of countries to stop dealing with the Islamic Republic but granted waivers to eight countries allowing them to continue importing oil from Iran.